Our Guided Tours include national scenic byways, waterways, and the enchanting places that we love to share with visitors and locals alike! You’re sure to discover and enjoy warm hospitality, nostalgic places, hidden works of art, locally-made products and wares, numerous waterways, stunning landscapes, and the rich history and Americana that make up the Starved Rock area and Illinois Route 66. Each custom tour includes an itinerary for a half-day or full-day tour that is tailored to your group’s interests, abilities, time, etc., with a local step-on guide. Half-day and full-day rates apply for step-on guide. Additional per-person pricing varies based on tour itinerary, activity fees, dining costs, etc. Our local step-on guide can board your motor coach, direct your driver, and deliver a narrated tour like no other. Each custom tour includes an itinerary for a half-day or full-day tour that is tailored to your group’s interests, abilities, time, etc. Or is your tour itinerary already planned? Let our experienced local tour guide help you navigate the picturesque back roads and show you the way! Half-day and full-day rates apply. Additional per-person pricing varies based on tour itinerary, activity fees, dining costs, etc. Need more time to take in all the sights? We’d love to plan a multi-day itinerary for you. We can take care of all the details, from your hotel accommodations, restaurants, activities, attractions, and shopping excursions to whatever else you want to do and see in Starved Rock Country and/or on Illinois Route 66. Per-person pricing varies based on tour itinerary, activity fees, lodging and dining costs, etc. Call or email for details. You might head here for the parks, for which we’re very well known, but you will want to stay – and you should – to check out our many other gems and jewels that make up the Starved Rock area. The millions of visitors who flock here every year have discovered our little piece of paradise. But you can take advantage of our inside knowledge of where to find the roads less traveled and outdoor playgrounds about which some of the locals don’t even know! Your trip adviser has the inside scoop and can assist you with planning a day visit or an overnight or multi-day stay. Your personalized itinerary is yours to complete at your own pace. Pricing varies based on tour itinerary, activity fees, etc. Join a group of like-minded tourists or be a tourist in your own backyard. 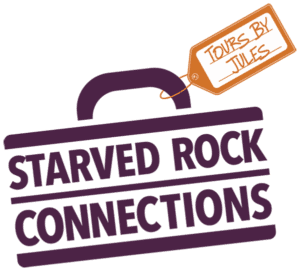 Starved Rock Connections hosts local and surrounding-area tours from time to time that are open to the general public. Check back soon for upcoming tours. Let’s get started creating your unforgettable outing. Check out our Tour Menu below for a sampling of the abundant options you can include in your custom itinerary. Experience Seekers: Are you up for an action-packed adventure? We’ve got it all right here in Starved Rock Country! Incredible, isn’t it? So what are you waiting for? Let’s get started planning your next amazing adventure. We’re only a click, call, or instant message away. Consultations are always FREE. Let’s get started planning your next amazing tour or getaway. We’re only a click, call, or instant message away. Consultations are always FREE. Let’s get started planning your next tour or getaway. Add one or several of the above stops on your personalized itinerary. We’re only a click, call, or instant message away. Consultations are always FREE. Let’s get started planning your next amazing getaway or tour. We’re only a click, call, or instant message away. Consultations are always FREE. Sometimes you just to have to get away, indulge yourself in a little pampering, and decompress with your gal pals. No deadlines, dishes or drudgery; just relaxing and reconnecting with your besties. You deserve it! You can always add an adventure along the way, too. Check out our other tour options, and let’s get started planning your next amazing getaway with your gal pals. We’re only a click, call, or instant message away. Consultations are always FREE. Natural beauty and scenery provide the atmosphere free of charge. Destination weddings and special life events should be about quality time with loved ones, dreams, affordability and, of course, location, location, location. The Starved Rock Area offers that choice destination! From gardens and mansions to the traditional or extreme, our distinctive venues offer picture-perfect locales that everyone can explore together and find some of the best Instagrams of your life. The rural charm and awe-inspiring scenery will steal your heart. Whether you’re having your wedding in the area or not, this is also THE place for your engagement, bachelorette, or bachelor party! Tip: Lodging fills up quickly during the high seasons, so it’s best to plan and book early. We proudly collaborate with many partners to create unforgettable events and experiences. Contact us to get started. We’re only a click, call, or instant message away. Consultations are always FREE. History lovers, this is your trip! Whether you’re hitting the open road or strolling through a charming town, historic park, or along one of our numerous waterways, fascinating history surrounds you. Let’s get started planning your next tour or getaway. We’re only a click, call, or instant message away. Consultations are always FREE. Let’s get started planning your amazing tour or getaway. We’re only a click, call, or instant message away. Consultations are always FREE. You’ll want plenty of time to savor the peace and quiet; breathe in fresh, fragrant air, and soak up all the natural wonders that are scattered throughout the area. You will find plenty of great pit stops along the way, and opportunities aplenty for some of the best Instagrams of your life! What surprises visitors the most is that we don’t just have farmland and flatland here. We have jaw-droppingly beautiful parks, trails, and awe-inspiring natural vistas that are just a quick drive away. Let’s get started planning your long-overdue, relaxing getaway or a fun group outing with friends, families or colleagues. We’re only a click, call, or instant message away. Consultations are always FREE. No matter the season, an iconic road trip is always warranted. Of course, the area is more thoroughly enjoyed by getting off the highway and exploring from the scenic back roads. You’re sure to discover warm hospitality, nostalgic places, hidden works of art, locally-made products and wares, and the rich history that make up the Starved Rock area and beyond. Our central location provides unlimited opportunities for guided and self-guided tours. Let’s get started planning the itinerary for your road trip. We’re only a click, call, or instant message away. Consultations are always FREE. Many folks agree that their favorite part of a getaway is immersing themselves in the local food and music scene, and sampling delectable specialties, and great chow! Who doesn’t love to wine and dine?!? And that’s just a preview of what you can find throughout our service area. You can also expect to find plenty of live music – indoors, outdoors, on land, and on water! Let’s get started planning your next amazing adventure, tour, or getaway. We’re only a click, call, or instant message away. Consultations are always FREE. Make your meeting or retreat a meaningful one and venture outside the conference room. The best event space or venue is critical to your event’s success and the guests’ experience. Taking a break from the daily grind is always a welcome respite for the team. And what’s a retreat without the “treat”? There are loads of traditional and, more importantly, non-traditional settings and activities in Starved Rock Country in which to mix business and pleasure and put that “treat” in the retreat. Whether you’re planning a corporate retreat, meeting, or fundraising event, we can assist you with planning the best one ever! We proudly collaborate with many partners to create unforgettable events and experiences. Let’s get started planning your event. We’re only a click, call, or instant message away. Consultations are always FREE.